Been a very busy week. Not for any specific reason, just lots of little ones. But I was able to get some stitching done. 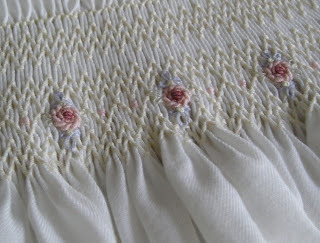 I finished the smocking on my baby dress last Saturday, (told you it would only take two movies) but it has taken the rest of the week of get the shadow work bow and bullion roses done. 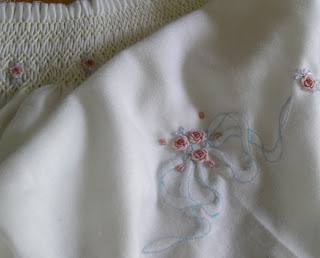 So today is going to be another "Stitch' Saturday" but spent at the sewing machine doing construction. I enjoy construction, but I enjoy stitching in my chair more. I have lots of things ready for construction. And that is what always stumps me. When I get to the collar I will post pictures. Gail Doane, from Utah, teaches a great way to do peter pan collars. No stretching or pulling and you get great collars every time. I am home by myself today to I can stitch in my pajamas again if I want to. My husband nor the cat really care if I stitch in my pajamas, but sometimes you feel like you ought to get dressed if he is. So today I will be in my sewing room. And since it is supposed to HOT today, I am quite happy to be inside. Our little cu-de sac is busy this morning, the neighbors are having a garage sale. 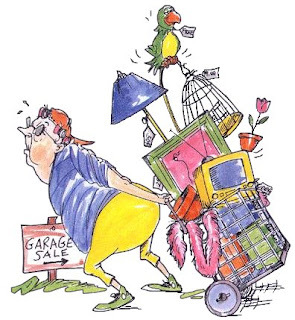 I think I must have a gene missing, garage sales have never been a big draw for me. I can do all kinds of bargain hunting online. One of my favorite sites is Smartbargains.com. (Great place for high end sheets and extra thick towels.) I don't mind the occasional estate sale but am not a big garage sale person. I have friends who have made delightful sewing, heirloom and antique finds at garage sales and I have often thought, "I should do that!" But just can't work up to much enthusiasm for it. But then I am not a very good closeout store person either. I want my store displays small, coordinated, visually spectacular and not mind boggling. I am not a "digger." Went to Filene's Basement in Boston one time with my best friend. That was enough for me. So to all of you true American bargain hunters, hunt for me! Pretty pretty pretty! I wish I could get my bullions to look like that! How lovely! Can't wait to see the entire dress.